In the physical world, one of the most incontrovertible truths is that magnetism and superconductivity are usually incompatible. Like two battalions of soldiers fighting over the same territory, when a material makes the transition from a normal to a superconducting state, it actively ​“kicks out” the magnetic fields from its interior; this is known as the Meissner effect. However, scientists have identified a few materials in which the two battalions can peacefully coexist, producing both magnetism and superconductivity. Research conducted in part at the U.S. Department of Energy’s (DOE) Argonne National Laboratory has identified another material that can produce both magnetism and superconductivity: ytterbium. 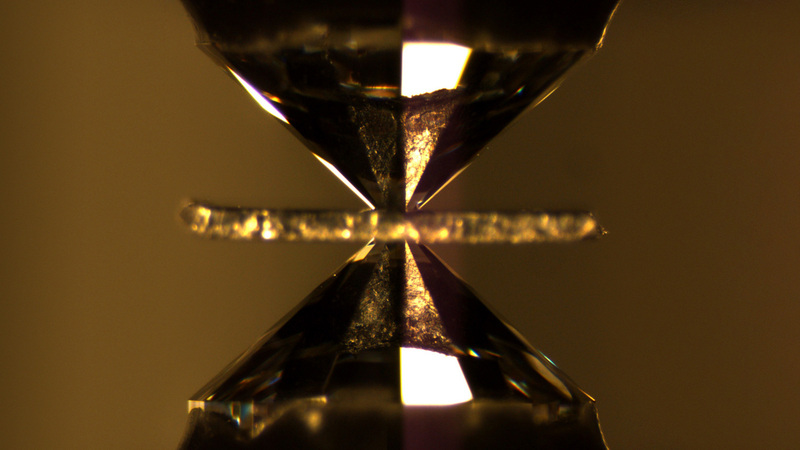 This finding is important because it potentially brings scientists a step closer in their search for a superconductor that can operate at room temperature, opening up myriad new applications. The project began in a physics lab at Washington University in St. Louis run by James Schilling, a longtime user of Argonne’s Advanced Photon Source (APS), a DOE Office of Science User Facility. Schilling, a recently retired emeritus professor of physics from Washington University, was working with his team on ytterbium, a non-magnetic chemical element in the lanthanide series. The finding was so surprising, in fact, that prior to publishing, Schilling was asked to confirm the result. To do so, he turned to scientists at Argonne’s APS: Daniel Haskel, Gilberto Fabbris and Wenli Bi. Their goal was to obtain a measurement, or X-ray picture, of ytterbium’s valence — an image of how electrons are arranged in an atom. According to Haskel, the leader of the Magnetic Materials Group, which is part of the X-ray Science division at the APS, Argonne was uniquely suited to the challenge. ​“APS is the only place in the United States where chemical valence can be measured at these extreme pressures,” he said. Haskel explained that the APS’s combination of brilliant X-ray beams with unique, high-pressure instrumentation allowed researchers to extend the pressure range in these measurements way beyond the pressures reached in many previous studies (about 350,000 atmospheres). Atmospheric pressure is the pressure within the atmosphere of Earth; for reference, the human body can withstand external pressures of less than 10 atmospheres. For their work with Schilling, Haskel and his colleagues were able to show the coexistence of superconductivity and ​“intermediate” valency to at least 1.25 million atmospheres. The intermediate valence state demonstrates fluctuations between compensated (non-magnetic) and uncompensated (magnetic) spin states in 4f orbitals of ytterbium atoms. Such a rapidly changing valence prevents magnetic order but enables emergence of superconductivity. Following a planned upgrade to APS, it will be possible to extend these experiments to even higher pressures — up to 5–6 million atmospheres. Haskel said he expects that significantly higher pressures will drive ytterbium to a single valent, magnetic state, where magnetic order is likely to compete with — and ultimately take over — superconductivity. Fabbris, an Argonne physicist in the Magnetic Materials Group who previously studied under Schilling at Washington University in St. Louis, was part of the research team and co-authored the study. He said what is most exciting is how the finding potentially relates to the search for a superconductor that operates at ambient conditions. Schilling said that ytterbium superconducts at only 5 Kelvin, which is about -450 degrees Fahrenheit and not a temperature that comes close to exceeding the current standard of about 200 Kelvin, or -100 degrees Fahrenheit. But with ytterbium newly added to the periodic table of elements as the 54th superconducting element (of which Schilling’s group has now discovered two, along with europium), he believes the unique nature of the finding will help solve the overall puzzle. The National Science Foundation and the National Nuclear Security Administration, though the Carnegie/DOE Alliance Center (CDAC), supported Schilling’s work. DOE’s Office of Science supported Argonne’s portion of the work under contract DE-AC-02-06CH11357. Part of the high-pressure instrumentation used in these experiments was funded by Argonne’s Laboratory Directed Research and Development program. What is the Meissner effect? The Meissner effect provides a key way to distinguish a perfect conductor – a material that merely has zero resistance – from a superconductor. In the Meissner effect, when a superconducting material is exposed to an external magnetic field, the magnetic field is excluded from, or cancelled within, the material. When a scientists cool a material below its critical temperature and apply a magnetic field, the magnetic field will be expelled every time. The exterior field near the material will increase to compensate for the cancellation of the field inside the material.